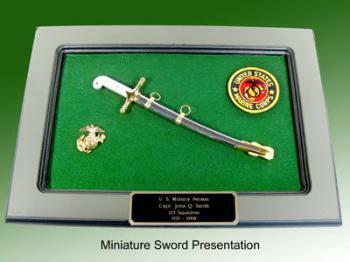 miniature Sword presentation plaque [PLA-314M] - $169.95 : Metalcraft by Blair - military gifts and memoribilia. This is a super presentation--- makes a really unique award presentation, can be made so sword is permanent to plaque or removeable for hand inspection. ------- if you do not specify we will make it permanent to frame. The miniature sword is metal and measures 11" long --- The frame is 17" x 12 1/2" and is olive drab green---You can not tell it from a real Sword..big advantage of this replica is that you dont have to worry about someone stealing it if you hang it on the wall..
We are showing this in a U.S.M.C... presentation but it can be any branch of the surface. Surface of frame is military olive drab green -- picture does not do justice to actuall color. If looking for a TOP GUN Award or top achievement Award then this is it.